At last, we're getting toys from Civil War - or, as it was marketed in the South, "The War of Captain American Aggression." Remember when new fans who had no idea how the toy industry works got mad that they couldn't find Rey, and found it hard to believe that manufacturers weren't telling their licensors which characters would be important? Well, the plot of Civil War was nowhere near as secret as Force Awakens, and yet this toy was manufactured, solicited, made available for sale and is even still listed in store computers as "Hero Ace Red." And his enemy was the mysterious "Lead Hero Combatant Blue." How will we ever break this devious code, Hasbro?! Unlike Captain America, Iron Man gets a completely new sculpt. Dude the film is named after is just a repaint, but the villain gets completely redone? Money is still the best super power to have! This suit is based on the comics' "Bleeding Edge" armor, which is kind of a funny recursion, since that armor was based on the first movie's suit. Anyway, it does mean that all those little circles sculpted all over his suit - on the shins, knees, hips, ribs, armpits, elbows, backs of the hands - should have individual little blue-white paint apps lining their centers, because while they look like giant slot-head screws, they're meant to be repulsor ports. His chest beam has a weird shape: the repulsor itself is circular, but it's set in a bottom-heavy hexagon that almost clips the top off the circle. 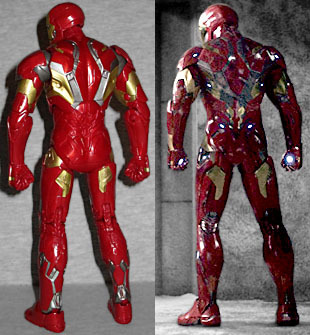 The Mark 46 armor does not come with an alternate head, like the Mark 43 did. That's incredibly disappointing, since this was the first armor to have a fully retractable helmet, rather than just a faceplate that lifts up. A perfect excuse to release a new Robert Downey Jr. face (in a way that was non-exclusive), and they didn't take it. Swing and a miss! 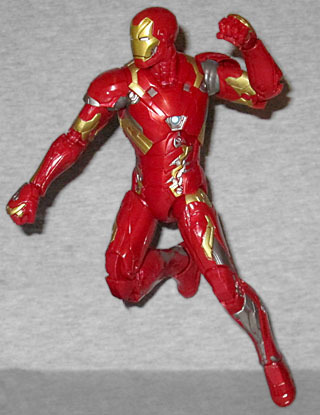 Iron Man may have a new body, but his joints are the same as we've come to expect from Marvel Legends: balljointed head, chest and hips; swivel/hinge shoulders, wrists and ankles; double-hinged knees and elbows; swivel biceps and thighs; and a hinged neck. 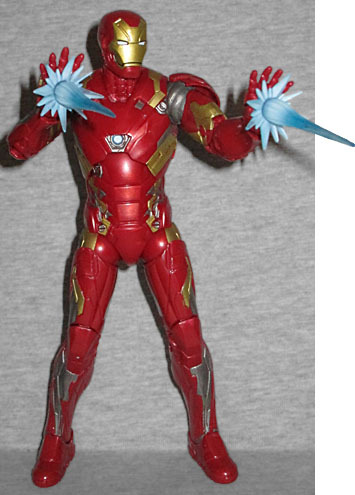 A lot of the joints are realistically limited by the design of the figure: the shoulders can only raise so far before the pads get in the way; the hips only move slightly to the front; and if you want to get him into anything resembling a palms-up repulsor blast pose, your best bet is to take the hands out, bend the wrists to position, and then put them back in. He certainly won't be "Iron Manning" any time soon. While the paint on the Mark 46 isn't as slap-dash as the Hulkbuster was, but it's still got its problems. We already mentioned the lack of paint in the repulsors (including the ones on the fists), but that's not where it ends. For one thing, there's a paint app missing on his left hip - it's completely gold, when there should be an entire section of silver like there is on the right hip. Furthermore, there's no paint on the small of his back; looking at images from the film, there should definitely be both silver and gold there (plus gold on the back of the legs just below the calves). But! The figure gets accessories! The kind we haven't seen before! In addition to the fists, he comes with a pair of open hands. No surprise there. What's different is that these hands have holes in the palm, allowing you to plug in the two included repulso blasts! 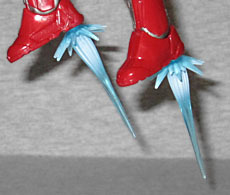 They're trans blue energy effects, painted with whitish blue at the base, and can also fit into the holes in his feet. These are actually a lot of fun, and add some simple value to what might otherwise have been "just" another Iron Man figure. He does come with a Build-A-Figure piece, obviously: his is Giant-Man's right arm. Which honestly doesn't look that much bigger than IM's own arm, but he's a pretty large figure himself, nearing the 6¾" mark. Civil War the movie did a better job of making Iron Man's side of the argument look sensible than Civil War the comic ever did (either comic - a new one just started, and yet again Tony is on the wrong side of the conflict), but he was still definitely the villain of the piece. One of them, at least. 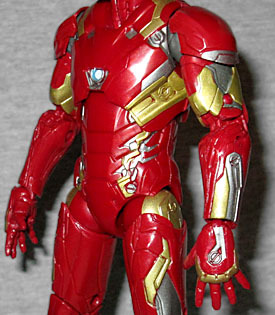 This toy isn't a major upgrade from the Mark 43, but it's a new sculpt of a new suit, and it's a good addition to your Hall of Armor.